Well, this certainly doesn’t make up for the sad lack of Suzanne September last year, but Typhon & the Ironthread brothers have made it to the mystical one, and he’s turned out to be a monkey!? Despite some map-reading errors–not mentioning any Sven names–we arrived safely at the shelter of the mystic today. It honestly just looked like a tiger trap to me, but what do I know about designing monkey homes? And I’m not just being mean there. The mystic was a real live (talking!) monkey. Also… I can now see why he is codenamed “The Thing that Never Should Have Been Given a Lemon Lollipop” — The Pablo (as he is otherwise known) simply cannot say his Ls. It’s pretty bad. Sven falls into the tiger trap! Anyway, we were just walking along, and suddenly Sven cried out. When Corin and I turned toward the sound, he was gone! “I’m down here!” We looked, and there was a pit before us, Sven and a mangy creature at the bottom. “Who dares to disturb The Pabwohh?” growled the creature. “Who is The Pablo?” I asked. 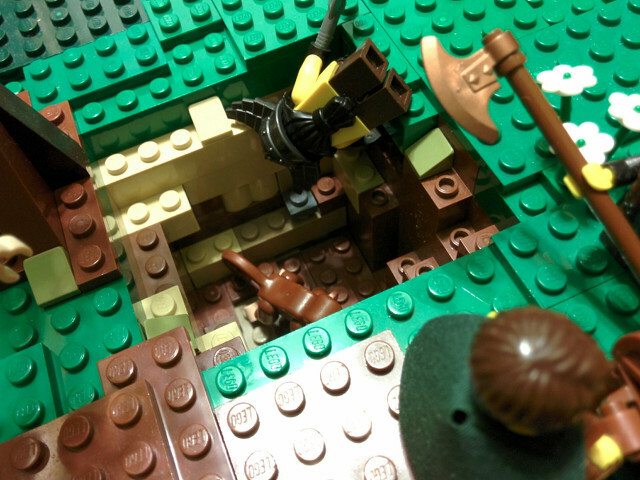 “We beg your forgiveness,” said Corin, semi-gracefully descending into the pit, “and we offer you your weight in gold for your counsel.” Realizing that The Pablo was the guy we had been looking for, I leaped down to join Sven and Corin in the now-crowded tiger trap. “Why would I want that?” The Pablo asked. I’m not making this up! He was truly puzzled as to why he would ever want our gold. “Earth? Hmm, wet me ask my memories.” He pulled out a large, round crystal and began talking to it. “Uh huh. Yes. Go on. Are you sure? Oh my. Okay.” The Pablo turned back to us. “What you seek can be found in a hidden wocation not overwy far from here. 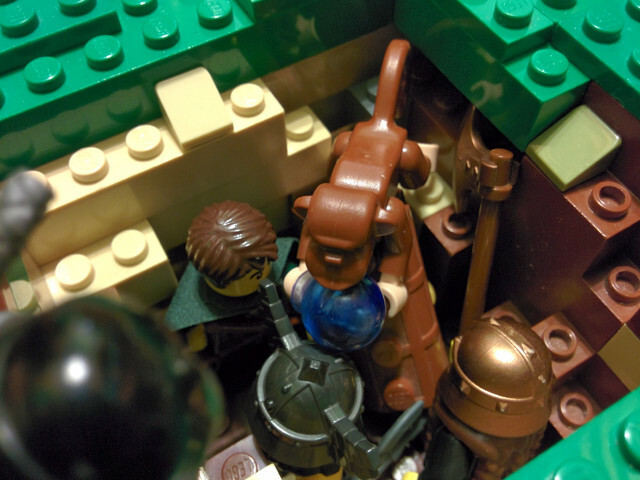 An organization known as the Adventurer Reguwation Committee, or ARC, has a secret base on a nearby ihwand. They often transport trolls and other monsters to Earth from there. “But you must not go. 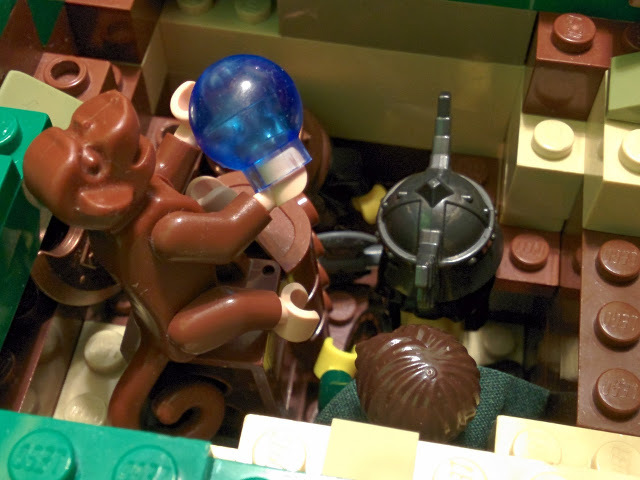 The guards would” the monkey made a hand motion and sound effect that seemed to indicate a painful death. “Wow, that’s kind of disturbing … you’d think they … huh,” said Corin. Whatever. As the thirteen-second-old adage goes (I just made it up now), one Dwarf’s disturbing is another Human’s perfectly normal. A safe way to return to Earth? The Pablo set the crystal down and thought a moment. “It seems your best chance of survival is to ahwow yourself to be captured, and then have your dwarf friends break you out of the dungeon. Then you can pretend to be a troll, and be transported to Earth with the rest of the recruits. “However! unwess you trick the guards into thinking you are someone important, they will probabwy just kill you on sight. “Therefore, I have decided you must impersonate the human warrior Gwinaarr. He is a maker of many troubles, and fearsome enough, I suppose. He would be captured, but Gwinaarr would probabwy not be placed in the high-security dungeon. After talking it over with Sven and Corin, we agreed that this was the best plan. Unfortunately The Pablo would not tell me anything more about the Adventurer Regulation Committee, saying that his memories needed to “rest”. So, the Adventurer Regulation Committee has a base on Multera, and a way to get to Earth from it! Sounds like a plan to me. Let’s hope Typhon can beat the odds! Purtty intrestin’ if ya ask me! That Pablo guy (monkey) seems a wee bit daft if ya ask me, well, daft compared to my ultimate sagely powers! Ooh ooh, ah ah! Scre1ech shriek! Ooh ah! *beating chest repeatedly* BUUURP!!!! Pabwohh, and I wuv wemon wowwywops! I find it rather ridiculous that he refused his weight in gold; just think of all the lemon lollipops he could have bought with that!